Your brakes slow your vehicle by pushing brake pads or shoes against rotors or drums, creating friction. This friction causes your brake pads to wear down over time, which is why brake pad replacement is a necessary part of regular auto maintenance. This brake maintenance guide will help you better understand how often you need brake service or repair and why knowing about your brakes can help save you money at the auto repair shop. There are two basic types of brakes: disc brakes and drum brakes. Disc brakes, like the one pictured to the right, operate by pressing brake pads against both sides of a rotor. Drum brakes are more enclosed, and work by pressing brake shows against the inside of a drum. Some cars may have one type of brake for the front wheels and another type for the back. Knowing the types of brakes you have is a good way to stay informed and understand the need for brake service and repair. The most common and most affordable brake service is brake pad replacement. The rate that your brake pads wear depends on a number of factors including driving patterns, vehicle type and auto part manufacturer. Different manufacturers have different recommendations for how often brake pads should be replaced. An average standard is every 30,000 miles, but a trusted auto technician will be able to give you specific recommendations for your automobile. When brake pads aren't replaced in time, the material that rubs against the rotor or drum wears out and metal begins to scrape against metal, causing damage. Sometimes rotors can be turned on a lathe to be made smooth again, but if too much damage has been done they must be replaced. 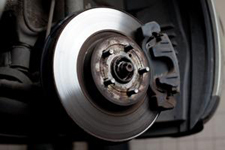 Replacing rotors or drums is the next most common brake repair service that auto shops perform. Lastly, a complete brake repair consists of replacing the entire braking system. In disc brakes, a caliper is what presses the brake pads against the rotor. When this component fails, the entire system is thrown out of whack. An ASE-certified auto technician has the skill and experience to diagnose and repair any brake issue you may experience. As is usually the case, catching any brake problem early will elude extra damage and avoidable auto repairs. If you're experiencing any of these symptoms, take your car, truck or SUV to a local auto repair shop right away. Brake inspection is relatively quick and easy, and is definitely worth the money you could save with timely brake pad replacement as well as the lives you could save by avoiding brake failure on the road. For brake service and repair by friendly, skilled and certified auto techs Hye-Tech Auto Covina, California can be reached at (626) 332-5452.